Welcome to your one stop shop for all your Barron Clothing and gifting needs. 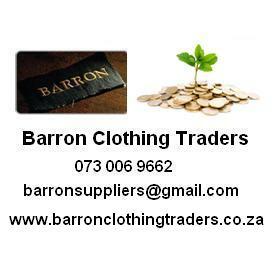 As preferred suppliers of Barron Clothing, we aim to satisfy your wants. We are able to bring you competitive prices for Barron Clothingdue to the fact that we keep our overhead costs low, partner up with some of the biggest players in the industry and then pass these savings on directly to you, the consumer. We offer embroidery, screen printing, digital printing, pad printing, doming, laser engraving as well as other branding options to make your brand stand out. To assist you effectively we require the following: Detailed description of the item’s, colors and sizes as well as, quantity of the specific sizes and colors. Most important, we require the product code as per our catalog. Post your list of items that we need to quote on. You will receive a quote within 12 hours (On working days). Should you not receive it after 12 hours please call us. Payments made on your quote number will serve as the activation of your order. Once your payment reflects on our bank account the order process starts. Note : We do not have an in-house store to view the items. The following delivery times does not apply to areas beyond JHB, Pretoria, West – and East Rand. From the date of process to the dispatching of your goods will require 4 to 5 working days. After goods enter dispatch delivery may be for the same day or overnight via courier. Should you be in the Johannesburg, Heidelberg or Vereeniging region we will send you samples via a rep. Once the rep is done they take the samples back again. For clients not in the Johannesburg region you can email us and we can courier samples to you, at your own expense. Is tourism heading for a disaster?